Motto: I kind of broke this thing. And that thing. And those things over there. Sorry. Every team needs its muscle and BULKHEAD is it. Designed primarily for demolition, BULKHEAD is a bull in a china shop, whether he wants to be or not. In battle, he's your greatest weapon. Everywhere else well, hide the breakables. He's not overly clumsy, but he's like a big overly enthusiastic dog who doesn't know his own size or strength. BULKHEAD has a natural curiosity about humans and their culture. He's especially interested in art, something that doesn't exist on Cybertron. On some level the creative urge is an attempt to compensate for all the destruction, deliberate or inadvertentm, that he causes. Problem is, most of his 'creations' either fall apart, don't look a thing like what he says they are, or are just plain ugly. Not that anyone would ever tell BULKHEAD that to his face. Robot Mode Power: BULKHEAD is easily the strongest of the AUTOBOTS. That combined with battering ram arms make him the ultimate Demolition Bot. If there's one thing BULKHEAD is really good at, its smashing stuff. It's his specialty. In fact, he's so good at it that he's even good at it when he doesn't mean to be. In a fight, you can count on him to smash the DECEPTICONS nearby parked cars, other AUTOBOTS, low-bloating billbords, and occansionally himself. The irony of it is that he's a natural builder who loves to make things, He'd much rather be creating something, but when you're as big and strong as he is, stuff just sort of seems to get smashed. Designed for demolition, Bulkhead is a one-bot wrecking crew. He's great in battle, but sometimes Bulkhead doesn't know his own strength. He may look like one mean machine, but he's really a softy at heart. Every team needs its "muscle" and BULKHEAD is it, designed primarily for demolition in battle he is your greatest weapon. In everyday situations, hide your breakables. He's not overly clumsy but he doesn't know his own size or strength. 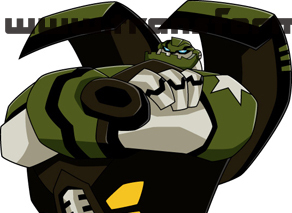 At first, BULKHEAD comes off as a dumb jock, but scratch the surface and you will realize that he is a softy at heart. ROBOT MODE POWER: "Wrecking Ball"
A massive wrecking ball comes out in place of BULKHEAD'S right hand. It is tethered to his arm by high-tensile cording. He can send it flying for a long distance. He uses his wrecking ball for hitting, crushing, baiting, ensnaring, and over-all DECEPTICON bashing. Really amazingly strong. But not very agile. Can throw or launch smaller AUTOBOTS up to a mile.